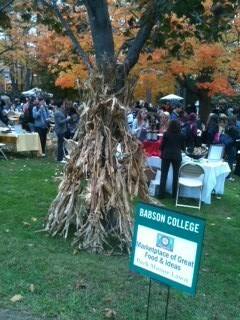 Did you miss Babson Food Day? 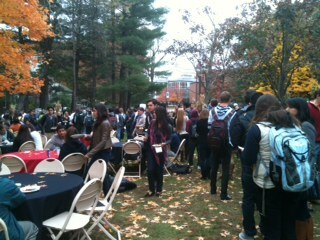 The weather was pure damp New England fall day, but the crowds were large and they were all eating and sampling, talking and rapping, learning and dancing. I joined the crowd on Park Manor Lawn at the “Marketplace for Great Food and Great Ideas” and took some snaps of what I saw. Above, the entrance to the Marketplace. Above, bottom, a long line waiting for hot food! And there was even audience rapping and dancing! Good luck. Think big. Come to Babson to talk about food and food entrepreneurship–entrepreneurship of all kinds! Barbara J. Selmo is the former Director of Graduate Admissions at Babson College. She has worked in graduate admissions for over 20 years, in several different disciplines.